Merseyside's top rated house & rubbish clearance company. Covering all aspects of public and commercial clearance work across the North-West, Cheshire and North Wales. We guarantee to beat all like-for-like quotes. Do you need an affordable house clearance company? Perhaps you’re after a professional, reliable removals company across Liverpool and the North-West? Then look no further. Check out our explainer video below! Welcome to Woolton House Clearance & Removal Services Liverpool. We pride ourselves in offering a low-cost, professional, fast and efficient service. We cover all aspects of clearance work, removals and the expert valuation of antiques through to modern goods. We specialise in all aspects of clearance work. We will undertake everything from the removal of old/unwanted furniture & appliances to the clearance of everyday household & garden waste. Additional clearance services include the de-clutter of a garage, loft, cellar or room – right up to a clearance of an office or property due to be sold or an emergency clearance of a friends or relatives home which has to be cleared due to a bereavement. We also offer a low-cost, professional, fully insured removals service. Whether it’s a move across town, or a move across country, we can cater for all your removal needs. We also offer a pick up and drop off service. If you need an item of furniture transferred from one address to another, or maybe you’ve bought an item of furniture online or from a High Street store who cannot deliver it to you for a week or so, we can pick the items up for you, same day, and deliver them to you, from as little as £25. 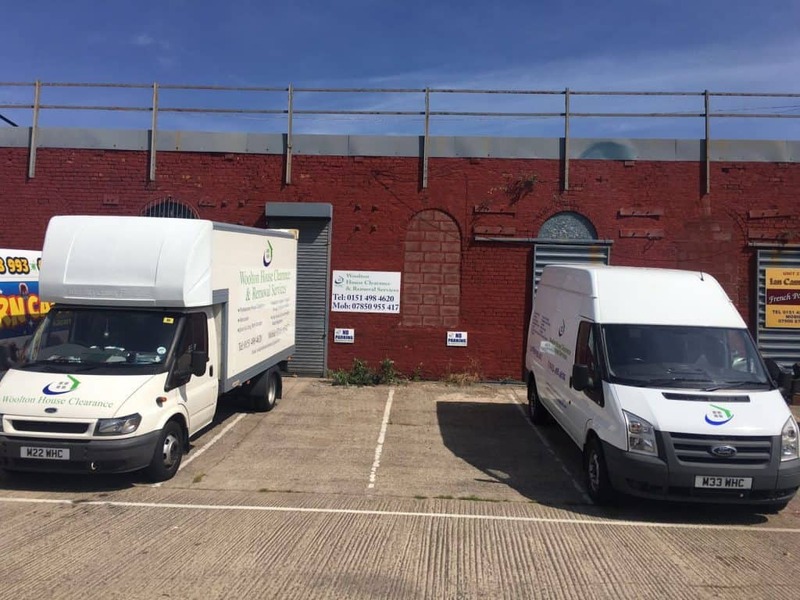 If you're looking for a low-cost, professional house clearance and removal services company across Liverpool and the North-West, then look no further. Contact Woolton House Clearance today for a free quote. Don't forget that we have dozens of verified 5-star reviews online, and we guarantee to beat every like-for-like quote you receive. Let's get you moving! We’re proud of our dozens of 5-star verified reviews online. We pride ourselves on our efficiency, professionalism and affordable cost that all of our customers receive. We also guarantee to beat any like-for-like quote on all of our removal services. If you come to us with a quote from a fully licensed, fully insured company like ourselves, we guarantee to beat it. For more information or a free, no-obligation quote, please don’t hesitate and call us today! Check out just a handful of our verified, 5-star reviews on Google from our happy customers. I'm writing this review relaxing in my new house with a massive gin and tonic which wouldn't have been possible without Michael and the Woolton House Clearance team's help. This wasn't just a "man and a van" type service - this was a really well organised and presented outfit. Thanks again lads for a great value, professional and efficient service. Really pleased with the clearance of my fathers house! Michael and his men were easy going and remained professional throughout keeping me updated at all times. They were the cheapest quote I had and I would recommend them for all aspects of clearances/removals. Cheers! We used this company for our house move today and I must say they were fantastic! Very professional, friendly and by far the cheapest quote I received whilst ringing around last week. I would definitely recommend you guys to my friends and family. Thanks again guys! Used this company for our recent house move. Gave them a call and the price quoted was by far the best I'd received. On moving day they turned up on time, they looked professional and were very friendly, they definitely relieved a bit of the house moving stress. The van was clean inside and all house items were handled with care. I recommended the company to my friend who wanted a loft clear out, she could not fault the service she received. Great company! Fantastic service by Michael & his team. Went above and beyond whilst clearing my mothers home. Cannot praise them highly enough and I would gladly recommend them to friends & family. Awesome service. Friendly guys. Quick, efficient and a good price. What more could you ask for?! Used Woolton House Clearance to clear late relatives house and they were excellent! Rang them on Monday they came next day and did an excellent job! Very reasonable, friendly and professional! Would highly recommend them to friends and family! Very impressed with Michael and Jordan when clearing my aunt's house today. They were not only quick and efficient but very pleasant and cheerful and I would not hesitate to recommend them.